Having enjoyed a wonderful holiday with our son and his family in Australia it was indeed nice to be back home despite the much cooler weather. My first official duty for the month was on Saturday 1 September, when I travelled to Charnock Richard for the annual meeting of the Division of Lancashire for the Red Cross of Constantine. The meeting was conducted by the Intendant General Michael Walker, and was attended by a very good number of the members of the Order from around our Province and supported by many distinguished guests from other Provinces. It was an excellent meeting in new surroundings. A very good venue which offered us excellent facilities and service. The following Tuesday, I travelled to Leyland in the morning for a catch-up meeting with Peter Taylor, at the Provincial Office in Wellington Park. It was good to hear that the Province had been in excellent hands during my long sojourn to the other side of the world and was now ready for the next part of our Masonic season. On Thursday of that week, I returned to Leyland with the morning taken up by an important training session for me. This was a ‘webinar’ video conference session with UGLE, giving detailed instructions on the use of our new computer system, ‘Adelphi 2’. In the afternoon I attended a meeting of another Masonic Order at Wellington Park. On 7 September, I made an early start to travel to the Sands Centre in Carlisle for the investiture and installation of Bill Bewley as the new Provincial Grand Master and Grand Superintendent for the Province of Cumberland and Westmorland. Both the Craft and Royal Arch meetings were presided over by the Deputy Grand Master Jonathon Spence and supported by the brethren and companions of the Province together with some 100 distinguished guests from other Provinces. It was an excellent but rather along day which ended with another good meal at the Shepherds Inn in Carlisle. The next day I had a relaxing morning, before Maureen and I departed in the afternoon to attend the annual ‘Craft Assistants’ Dinner’ at Ormskirk Masonic Hall. This is always a great occasion and at it the assistants and past senior officers of the Province are able to partake in an excellent meal and catch up with friends and colleagues. It was a delight to see so many attending this annual event. On Tuesday of the next week, I had an early start and I was joined by David Grainger, Geoffrey Bury and Paul Broadley at Lancaster station for the train to London Euston. We were joined by Phil Gunning at Preston and we all enjoyed a very interesting and fulfilling journey to the capital. After checking into our hotel, we walked to Grand Lodge in Great Queen Street for the promotion’s investiture meeting of the Mark Masons. A full temple witnessed many brethren from West Lancashire receive their well-earned promotion. Following the meeting some 30 plus brethren supported the West Lancashire Mark PrGM Keith Beardmore at the festival banquet before they had to return by train to the north west. I walked back to my hotel and enjoyed an evening in the company of several brethren, who were staying over for the next day’s meeting. Well, following breakfast it was a pleasure to walk back to Grand Lodge for the Quarterly Communication meeting of Grand Lodge, which again saw the temple full to capacity. I was joined by Phil Gunning, David Grainger, Kevin Poynton, Geoffrey Bury, Paul Broadley and Eric Drinkwater. Following this meeting we decided to eat at a local restaurant rather than the Connaught Rooms, before returning to Euston for our homeward train journey. After breakfast, on Friday 14 September, Maureen and I joined the brethren of the West Lancashire Masonic Fishing Charity for a day`s fishing at Whitmore Fisheries near Kirkham to witness the enjoyment of eight young men from Wigan, engrossed in pulling fish from the lake. What a wonderful new experience for them and indeed for us too. Following the presentation of medals and certificates, we travelled to Chorley Masonic Hall. This was a day that many brethren in West Lancashire have been waiting for, for some time. The celebration of 50 years as a Craft Freemason of Thomas Firth Jackson. There were guests from many parts of the country, including four Grand Masters of other Masonic Orders, who joined some 110 brethren, who gathered to enjoy the delights of the ceremony that I was honoured to preside over. Following a most interesting and somewhat humorous discourse in the ceremony we adjourned to the dining room for a delicious meal and entertaining speeches before returning to Morecambe. With Stephen Blank on our visit to ‘Papyrus’. On the following Monday, George Fox and I travelled to Warrington to join with our colleagues from Cheshire. 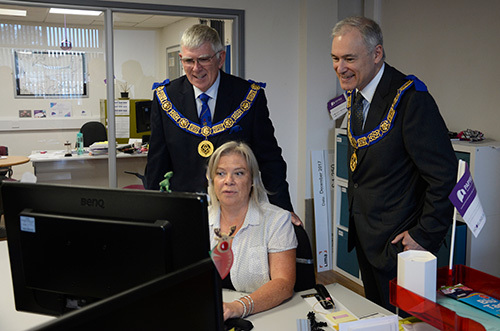 We were visiting the headquarters of the charity ‘Papyrus’ and marking the award of a grant of £65,000 from the MCF, which had been made on behalf of West Lancashire Freemasons. On arriving at their premises, we were warmly welcomed by their CEO and other staff, who explained the essential work that Papyrus does in seeking to reduce the number of deaths through suicide, in young people. The next day I was accompanied to Barrow-in-Furness by Keith Kemp. We were attending the installation and 150 years celebration meeting of Hindpool Lodge No 1225 at Fairfield Lane Masonic Centre. On arrival we enjoyed a wonderful afternoon tea, prepared by the ladies of the lodge. Welcomed by more than 120 local brethren, we witnessed an excellent installation ceremony, which saw Paul Musgrave attain the chair of the lodge. Following the ceremony, I was presented with a remarkable donation for the MCF 2021 Festival. A delicious banquet followed before we returned, around the bay to Morecambe. The Wednesday of that week afforded me a morning catching up with emails and paperwork before leaving just after lunch, to travel to Widnes. Keith Kemp and Peter Taylor joined me at Widnes Masonic Hall for the first installation meeting of the newly organised Athenaeum Lodge of Installed Masters No 9368. Peter Mann was placed in the chair by Stephen Kayne and we all witnessed an excellent ceremony. This lodge was retrieved from the brink of handing in its warrant by brethren who are volunteers at WLFC. We were all very well received by some 100 brethren from various parts of the Province and following the ceremony enjoyed a pre-dinner drink and chats in the bar, prior to enjoying the Festival of St John. A marvellous anniversary meeting at Hindpool with the local ‘light blue’ Cavendish Club members. The next day, Maureen and I sailed off to the west and into the sunset. We were bound for the Isle of Man and specifically for their Provincial Grand Lodge meeting. We had a very calm cruise across the Irish Sea following the storms of the previous day. On Friday 21 September, after a leisurely morning and a walk into Laxey, I made my way in the afternoon to Douglas Masonic Hall. This building has been substantially rejuvenated, following the collapse of the main roof. Here I was joined by a number of brethren from West Lancashire, namely Derek Parkinson, David Ogden, Peter Taylor, Freddie Wright and Joe Williams. We enjoyed an excellent meeting presided over by Keith Dalrymple, which was followed by a dinner in their newly refurbished dining room. Many of the visiting ladies joined us for a dinner at the hall. A most enjoyable evening was had by everyone. The next day was a ‘free day’ in the Isle of Man for sightseeing by all the visitors who had attended the meeting. In the evening we were entertained at the Ramsey Masonic Hall. Here we met many brethren of the Isle of Man and their ladies, for a very casual and most enjoyable social evening. Whilst most of my colleagues returned home the following day, Maureen and I stayed on for a couple of more days. We spent the time meeting up with other friends on the island and enjoying Sunday lunch with a very dear friend. On the Monday, we had another very relaxing day on the island, but the weather was not too good, so we could not walk out too far. In the early evening, we set off from Laxey to Douglas for the sailing back to Heysham. Again, we were very lucky with the weather and we had a wonderful cruise home. On Wednesday, I chaired a Craft Cabinet meeting at Leyland. It was a hectic day, but we were able to get a lot of work done. 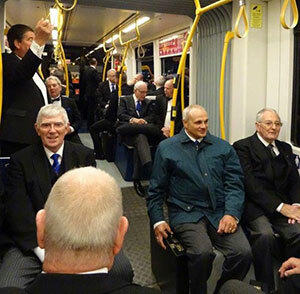 On route, by tram to Thornton and Cleveleys Lodge Centenary meeting. I headed off to Eccles, on the Friday afternoon to visit Elm Bank Masonic Hall, for the centenary meeting of Chapter of Hope No 2679. I was welcomed by many companions from around the Province and from the chapter and group to this very special meeting. I was accompanied by Maureen, who had been invited to dine with the ladies that evening. I was also accompanied by Colin Rowling, Kevin Poynton, Brian Crossley, Stuart James Shea, Tony Edden, David Walmsley and Malcolm Warren together with David Barr and many other acting Provincial grand officers. Rev Canon Godfrey Hirst gave a wonderful oration on `Hope`. What a wonderful occasion we had, and I had the great pleasure of promoting Brian Lawrence to PPrGSrN. I was presented with a wonderful donation to the MCF 2021 Festival and we enjoyed a delicious meal before heading home. Saturday 29 September, saw Maureen and I, accompanied by Keith Kemp, travel to Cleveleys Masonic Hall for the centenary meeting of Thornton and Cleveleys Lodge No 3854. We arrived at the hall around lunch time, to be met by the group chairman Peter Greathead and his wife Sue. Sue took charge of Maureen and off they went for the afternoon. Peter took charge of me and off we went on a tram to the Savoy Hotel in Blackpool where the meeting was to be held. Following a rigorous rehearsal for all involved in the ceremony, we entered the lodge at 4pm prompt and enjoyed a delightful ceremony enhanced by the oration delivered by Rev Canon John Hall. Before closing the lodge, I promoted Eric Peat to the rank of Past Provincial Senior Grand Warden and I was presented with a wonderful donation to the MCF 2021 Festival, thus enabling the lodge to attain ‘Grand Patron’ status. We then retired for pre-dinner drinks followed by a most enjoyable banquet. After all the speeches were over we left the Savoy Hotel and travelled by tram northwards through the illuminations and back to Cleveleys Masonic Hall. Here we were reunited with our ladies who had been dining at the hall. What a wonderful finale to a fantastic evening. This brought my September Masonic duties to an end; it was a busy month that will long be remembered for its exceptionally special meetings. Time now to relax until the next month comes along.